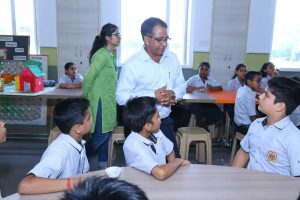 The School frequently organizes motivational talks, seminars and workshops for teachers to hone and update their teaching skills and knowledge on a continuous basis. Many of these events are held to keep our teachers motivated, inspired focussed. The aim is help them find out the latest trends, methods and materials in effective teaching and learning as practiced in the world, especially in such countries as Finland, Switzerland, USA, UK, Australia, Germany, France and Canada. Teachers are encouraged to be as autonomous as possible. Each of them gets plenty of opportunities to develop and showcase their leadership abilities and acumen. Personality development and memory enhancement programmes are also organised for teachers as well as students.